Surrounded by mountains and sea, the Sicilian city of Palermo has obvious charms – indeed it was named Italy’s Capital of Culture for 2018. And although its unique attractions take a while to reveal themselves, away from the Vespas, the teenagers peacocking outside bars, and the balconied houses lending much-needed shade, are historical gems and cultural treasures galore. A delightful mix of faded opulence and super-chic shops and restaurants, this wonderful city offers everything you could want in a cruise stop. It couldn’t be simpler. The port of Palermo is situated right in the heart of the city and so it is as simple as getting off the ship and making your way into the centre. As far as distance is concerned, you wouldn’t be looking at much more than a 15-minute walk to the main shopping drag and a leisurely 25-minute walk to the historic old town. Taxis are readily available and fares cost from €10. 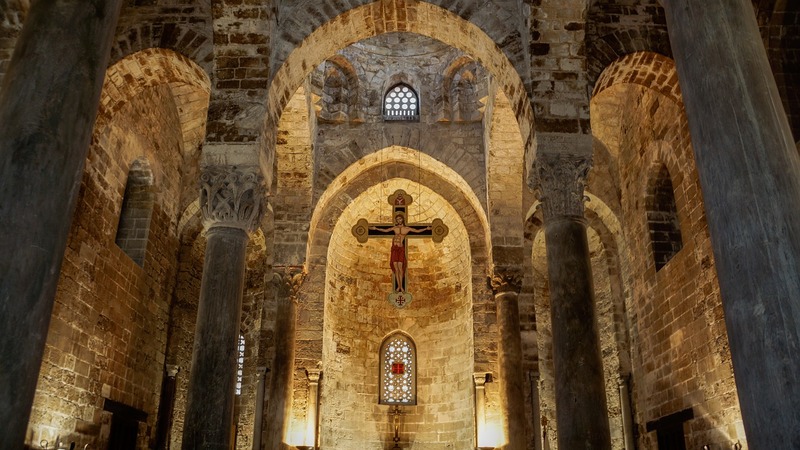 Palermo Cathedral: You can’t miss this massive edifice, and neither can you fail to be impressed. At various times in its rich and complex history, the cathedral has served as a mosque and burial place of Christian kings – hence its encyclopaedic range of architectural styles (Norman, Moorish, Gothic, Baroque and Neoclassical). only a few years ago), the building is richly decorated with paintings, marble ornamentation and endless frescoes, creating quite a wow moment when you walk through the doors. The Catacombs: Not for the faint-hearted, the Catacombe dei Cappuccini houses nearly 8,000 corpses dressed in their Sunday best. The oldest is Friar Silvestro da Gubbio, who was interred in 1599, and the most recent dates from the 1920s. It’s believed that the dry atmosphere in the catacombs allows bodies to mummify naturally, and many are astonishingly well preserved. Costing just €3 per entry, the experience is fascinating, historically and culturally significant, if more than a little macabre. Focacceria San Francesco: A culinary institution since 1834. This is the place to try Palermo’s famous Sardi a’ Beccafico, or sardine roulade filled with raisins, pine nuts and onion (it tastes far better than it sounds). I Cuochini: Sicilians are very proud of their bite-sized fried treats and this local institution serves all the favourites: arancini (deep fried rice balls), pasticcini (salted meat sandwiches) and panzerotti (mini fried calzone). Osteria Mercede: You can’t visit Sicily and not try the incredible seafood. Located near the Teatro Massimo, this cosy seafood restaurant is well worth a visit. Try the octopus! Via Ruggiero Settimo: Want to splurge on some high-end fashion? This is the main shopping street in which to find those iconic Italian shopping houses. Ballaro Street Market: This famous market is paradise for lovers of street food. For roughly seven city blocks, you’ll haggle with friendly merchants as they entice you to buy all manner of local delicacies. Corso Alberto Amedeo: Head here to find a delightful range of antique and art shops – ideal for those hunting for souvenirs to last a lifetime. Keep an eye on the traffic. Sicilians aren’t the safest of drivers and if you’re not looking where you are going you’ll soon find yourself clipped by a speeding Vespa!